The Accel is an automatically-unloading, self-cleaning, nested-base CNC router in the high-performance line of compact nesting machines from NewCNC. The automatic, machine-driven unloading and cleaning can reduce total cycle time significantly when compared to traditional, operator-driven unloading. The Accel pushes finished parts onto an unload table, then cleans and prepares the work table for the next sheet of raw material. An operator needs only to load the material before the machine is cutting again. This results in more time cutting, and less time waiting. The Accel utilizes industry-leading components, such as Yaskawa servo motors, a 12.6 horsepower Hiteco HSK spindle, and OSAI controls to generate predictable, reliable, pace-setting production. 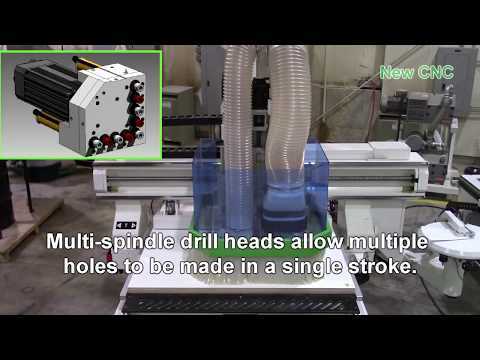 The machine is compatible with all industry-standard, G-code based CAD/CAM software programs. The Accel includes everything required to run the machine, including features which other manufacturers present as costly, buy-up options. The automatic unload and self-cleaning features, along with the price, the ease-of-use, and our first-name-basis approach to service and support make the Accel one of the most accessible options for a business looking to support efficient full-time production.